“The best way to get a job is through networking.” Networking can help improve your career, network for jobs, and meet people with the same career interests. So, while you are busy responding to open positions on job boards and company websites, the people that are hiring and the people that are recruiting for those that are hiring…are looking in other places. 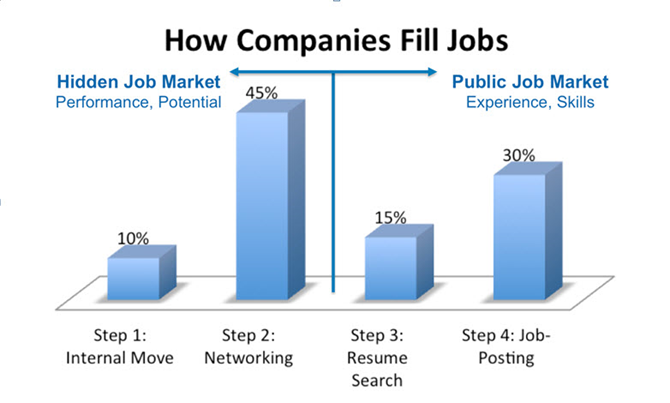 Look back at the table above on “Hiring Economics,” and you will see that the majority of jobs are filled through internal promotions or through networking. Therefore, to increase YOUR chances of being hired, you need to be “found”, and a great way to be found is by being connected and actively managing your connections—that is called networking! If you are currently in the market for a new position, how are you spending your time? For more information on how the job search has changed, take a look at this article from the Huffington Post: 10 Ways The Job Search Has Changed (2013).